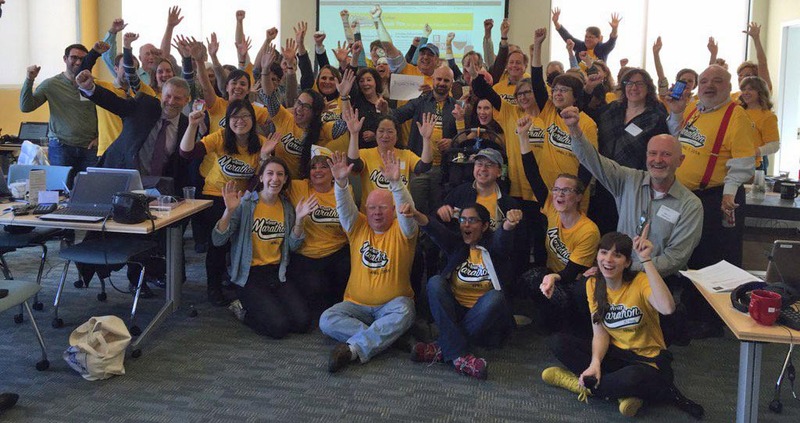 WBUR volunteers and staff celebrate reaching our $1 million marathon goal. Volunteering is a great opportunity to support WBUR! We appreciate help from both individuals and groups to answer phone calls during our on-air fundraisers, and help callers make donations over the phone. Some computer literacy is necessary, but we'll provide all the training you'll need when you arrive. During each shift we provide delicious food from some of Boston's best restaurants, a behind-the-scenes tour of WBUR, free parking, and a fun, friendly atmosphere. Our next volunteer opportunity is during our upcoming Spring Marathon, April 3rd & 4th. Stay up-to-date on the latest volunteer news and opportunities by signing up for our email list here. If you have questions please email us at volunteer@wbur.org or call (617) 353-0675 or (800) 909-9287.